Bill Roberts was born and raised in Michigan’s northern lower peninsula. His hometown of Lake City is surrounded by great fishing lakes such as Lake Missaukee, Lake Cadillac, and Jennings Lake. Bill fished them all, as well as the Manistee and Clam rivers. Mosquito creek runs through the Roberts property, and not only has produced fantastic brook trout fishing, but also some of the most famous mosquitoes ever. William Roberts Senior, Bill’s Dad, taught him to fish there. Bill began carving after he retired, and his skill has steadily grown with each passing year. Bill and Betty successfully raised six kids (5 smart, and one good looking…). While working for the U.S. Postal Service, they also began the Roberts Tree Farm, growing and selling Christmas trees. The tree farm was a wholesale operation until Bill retired, and then each year they spent the month of December on their retail lot in Tennessee. 2004 will be remembered with great sadness. On October 7th, Bill’s wife and best friend Betty passed away. They were always together, even at the carving shows, and it goes without saying how much she will be missed. This 8″ 1/2″, Bass fish decoy is by seasoned fish decoy carver Bill Roberts, Lake City, Mi. 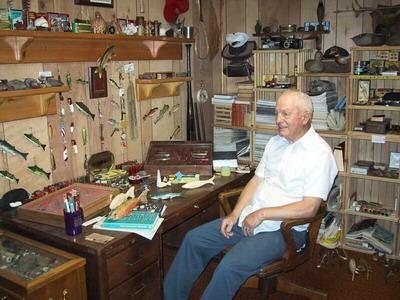 Bill is an icon in the fish decoy carving world and a great supporter of winter Darkhouse angling. Bill has donated this fish decoy to the Michigan Darkhouse Angling Association, (MDAA) for their yearly EBay Fund Raiser to support Darkhouse Angling in Michigan.